Naves is found a couple of kilometres west Les Vans, close to the south-eastern border of the Ardeche. 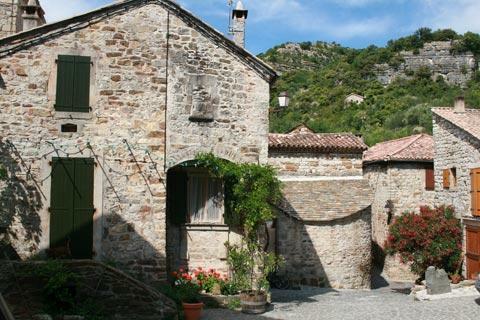 The village is listed as an Ardeche 'village of character'. Note: Naves doesn't exist as a commune name anymore - it is part of Les Vans, a larger town in the Ardeche. Hence in guide books it is sometimes referred to as Les Vans (Naves) - confusing, as you set off to explore Les Vans...be aware that they are separate entities a couple of kilometres apart. 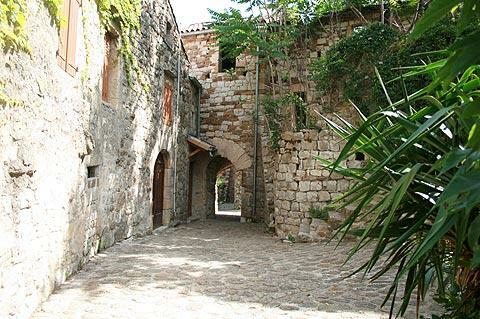 Cars are not permitted to enter the village of Naves - it is a pedestrian only village. Parking is along the road below the entrance. 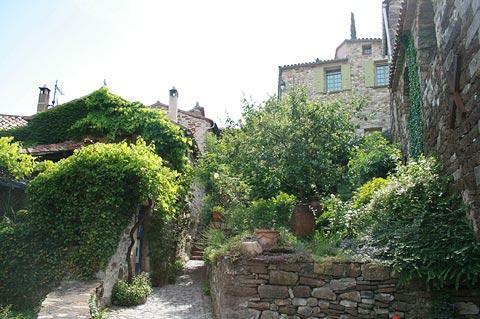 Although the centre of Naves is small it has some lovely old properties to admire and a great deal of charm. 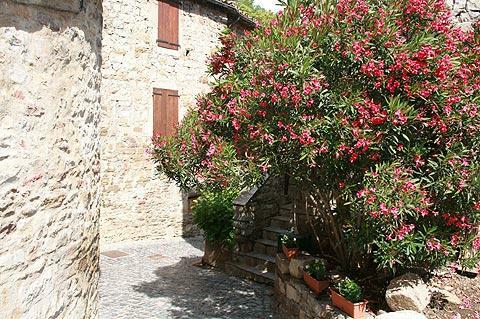 Enter the village and stroll along the narrow passages through the village as they pass between some very picturesque old houses, with plants and flowers bursting from every available space. As you explore further into the back streets of the village you find the properties progressively more abandoned, until reaching some which are now in ruins as if waiting to see whether they will be renovated and become part of the 'tourist attraction' or disappear for ever back into the mountains...keep going there are further great views at the far end of the village. 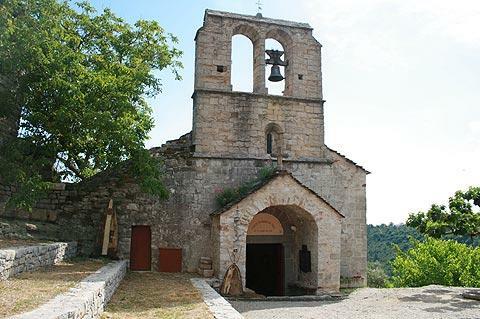 Most paths end at the small square in front of the pretty little church in Naves (in use as an art gallery at the time of our visit) - an attractive spot with steep terraces tumbling away down the hill below the church. There is also a 'sentier botanique' that follows around the back of the village, a chance to see and enjoy a little of the surrounding landscape and enjoy the regional plants and flowers. The pathway is signposted to the right shortly after entering Naves village. Les Vans, the nearby town which now includes Naves, is a pleasant town for a stroll and has a small historical centre around the church. Although it has no particular highlights, Les Vans has all facilities and supermarkets, banks etc. and there are also a couple of museums, including a Museum of Archaeology. 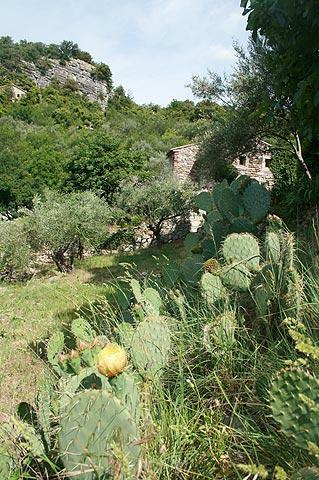 There are numerous other historic villages in the region around Naves. 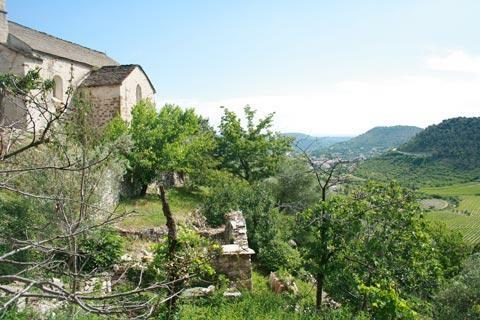 If you have limited time our favourites are Banne and Labeaume because they both combine the charm of an ancient village with exceptional scenery.